As one of the most beloved dishes across Louisiana, jambalaya holds a special spot on many dining tables throughout the fall and winter. 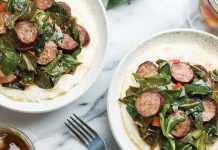 This quintessentially Louisiana dish likely grew from the state’s Spanish heritage and reflects the diversity of the area. Many jambalayas from New Orleans and southeast Louisiana include tomato, while Cajun jambalayas do not. 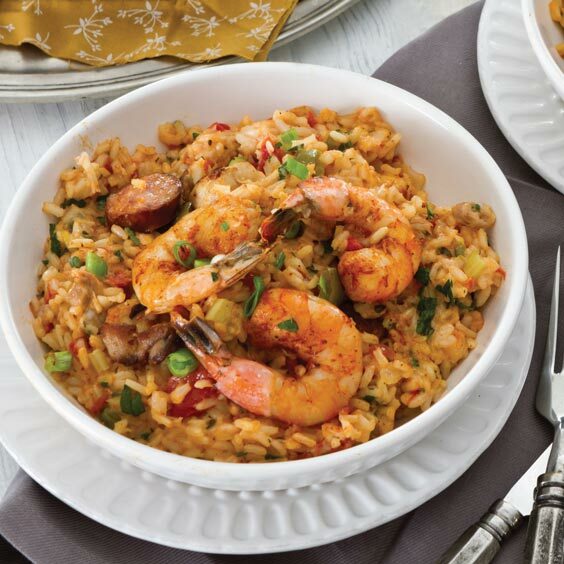 Chicken, Andouille, and Shrimp Jambalaya combines some of our favorite Louisiana flavors. Whether as a Sunday supper for family and friends or the centerpiece of a tailgating party, jambalayas are perfect for entertaining. It’s easy to double (or triple) Chicken, Andouille, and Shrimp Jambalaya batches, and ingredients can be added or removed to fit personal preferences and dietary requirements. In a large Dutch oven, heat oil over medium high heat; add sausage and chicken, and cook about 5 minutes or until browned. Add onion, celery, and bell pepper, and cook, stirring frequently, about 3 minutes or until tender. Add garlic, stirring for about 30 seconds until fragrant. Add rice, and stir about 3 minutes until lightly toasted. Add tomatoes, and stir until juices are absorbed. Add broth, thyme, and bay leaves. Bring to a boil; reduce heat to medium-low. Cover, and cook for 15 minutes or until rice is tender. In a medium bowl, combine shrimp, 1 teaspoon salt, 1/2 teaspoon black pepper, paprika, cayenne, and parsley. Add shrimp to rice mixture, and stir until combined. Cook for 2 minutes or until shrimp are pink and firm. Add remaining 1 teaspoon salt and 1/2 teaspoon black pepper. Garnish with green onion, if desired. Serve immediately. I can’t wait to try this,i love to cook and use my family to judge the food. So,i will be trying some other new recipes with this,just a combination of things,and see how well i did. Holy cow was this good. I added some okra and did 1 14 oz can diced tomatoes and 1 10 oz can rotel tomatoes with chilis. .5 lb beer brats and .5 lb and andoullie. Best jambalaya I’ve had next to Buffa’s. What part of the recipe do u add the Okra. Also what type of rice do you use? I made this today because I couldn’t find the recipe I normally use. It’s delicious! I have some frozen crawfish in my freezer can I add it to this recipe along with the rest of the ingredients? You certainly could! We would probably add the thawed crawfish with the shrimp. Can you cook this in a crockpot? If so, how long? Unfortunately, we would not recommend cooking this particular recipe in a crockpot BUT we are looking into developing a special slow-cooker jambalaya! Stay tuned! Great recipe, I made Emril’s Essence for the spice. The best jambalaya, the restaurants in this area can’t compare. I’m going to try this recipe and use quinoa in replace of rice… hopefully the measurements turn out ok! Keep an eye on the cooking time and liquid level, and let us know how it turns out! Jordan, did the substitution of quinoa for rice turn out in this recipe? Will this recipe work on the NuWave2 PIC. And if so what size is your dutch oven. 3.5 qt or bigger. You’ll definitely want to use the largest Dutch oven (or heavy pot) that you have. At least 6 quarts. Man, that was delicious! Only thing I would do different is substitute Old Bay for some of the spices. It would add that familiar flavor. In Step 3, you’ll take half of the salt, and half of the pepper to make the spice mixture, then use the rest at the end of the step. The good news is that jambalaya is a very forgiving dish. If you add a little more or a little less diced tomato, you’ll still be fine. Because you’re reducing it, keep a close eye on the cooking temperature and cook times. Thank you so much! Trying this tomorrow. This recipe was excellent. I’ve been making Jambalaya for many years after a trip to New Orleans in the late 80’s. Lost the original recipe but used to play it by ear. This time my daughter wanted to try making it and I automatically thought of this site. She tried this recipe and it was perfect the first time. Steps were very easy to understand for her (she’s 16 and still a beginner cook) It was incredible and thankfully more than enough food to feed all of us including her brother. It had just the right amount of heat also, though my daughter and I add a bit more heat as we love things spicy. I’ve since passed the link to this recipe to three other people who begged me for the recipe. Thank you so much. I’m new to this and the directions to cook aren’t really clear.. im cooking chicken sausage and peppers onions and separately I’m boiling broth and tomatoes and rice til tender? Thanks for asking! You actually add all of those elements to the same pot (e.g. the chicken and sausage are added first, five minutes later the vegetables are added, and so forth). This was fantastic!! My first attempt at cooking jambalaya, and it was an overwhelming success. Can I substitute chicken breaths for thighs, I find thighs abit fatty, or do a combination? You certainly can make that substitution (or use a combination). Can you tell me how to double this recipe…I don’t want to mess up the rice to liquid ratio. Having a Christmas party and would love to serve this. Thanks so much! This is a fairly straightforward recipe to double: you’d be using 6 cups (uncooked) long-grain rice, and 10 cups chicken broth. Can I have pasta instead of rice? If so, how would I do it? Can I make this ahead (early in the day) then heat and add the shrimp? Resultant jambalaya is OUSTANDING. Great recipe! I don’t have a dutch oven. Can I use a big soup pot? You sure can. We like to use Dutch ovens because they distribute heat evenly. Thanks! Maybe it’s time I invest in one. I just made this for dinner ,it was so delicious. My husband loved it. Can this be made ahead of time, frozen, then thawed and reheated? I’m having a casual dinner party for 8 but don’t want to be cooking when guests are here. Also, do you have suggestions for side dishes? Thanks. I’m looking forward to trying this after all the rave reviews. Jambalaya can be frozen for about 3 months, so yes, you can definitely reheat this after thawing. There’s a couple options here. You could do stovetop, though with guests arriving, that may be more labor intensive than you’re looking for. You can also put it in a Dutch oven, reheating in the oven at 325-F for about 25 minutes; you may want to add just a little broth or water to keep the rice from drying out. Then, there’s the always faithful Crock Pot or slow cooker option. Thank you so much! I did end up freezing it so I’m glad to know a good way(s) to reheat it. By the way, the dish was a hit. People asked for seconds! Is it okay to freeze this dish to have for later? Also, to make it Cajun style, what would you use in place of the tomatoes? If you take the tomatoes out, the dish will need more broth to simmer in since you’ll lose the juices from the tomatoes. Try about half a cup to start, and if that isn’t enough, try another half. Making this for a progressive party. I need to make it ahead of time since I have the fourth course. Can I keep it warm in a Crock Pot? Definitely! Just follow the recipe and when you finish, then move everything to your Crock Pot and set it to “Keep Warm.” That will keep this dish ready for your guests! I also recommend a slow cooker liner for easy cleaning post-dinner – sometimes rice can be pesky during clean-up. Thank you so much! I’ll let you know how it turns out. Don’t know if this will get through but I’m using smoked chicken instead of all white meat. I’m sure it will give a much better flavor. Go for it, Mike! Let us know how it goes. Can I substitute some shrimp/seafood stock for the chicken stock? I’m thinking no more than a 50/50 blend. Hi Brad! Yes, you can, but it may change the flavor a bit. I would try 25/75 for the first attempt, and if that isn’t enough for you, then try 50/50 then next time you make it. Keep us posted on how it turns out! Can pasta be substituted for the rice for Pastalaya? Hi Rod, it wouldn’t be as simple as substitution since rice requires much more liquid than pasta. It’s difficult to say how much liquid you would need to cut back. But Kid Chef Eliana’s recipe for Pastalaya has some similarities to this jambalaya: https://www.louisianacookin.com/pastalaya/. Hi Danny! Dried herbs tend to be more concentrated than fresh, so for the fresh parsley and thyme, you will need 2 teaspoons of the dried herbs instead of the 2 tablespoons of fresh. You may only need one bay leaf if you’re using dried bay leaves but have a second one available, just in case. Im so excited to make this but i only want to make enough for 3 people. How would i cut the recipe to make it so it’s not so much? Hi Yvonne! Cutting recipes can be tricky work, so we wouldn’t recommend cutting this recipe by more than half. This will leave you with plenty for second helpings or delicious leftovers. Made it tonight! Delicious! Love it. Thought first the spices were not a lot but it was perfect with a little kick to it.Great recipe!!! Thank you for sharing with us, Tanja! Glad you liked it and were able to adjust it to your preference. Tried this recipe last night, and it was so good! My boyfriend loved it! That’s awesome, Jaime! Glad you both enjoyed it. I live in California. I made this recipe for a Super Bowl crowd, many of whom are from New Orleans. Everyone loved it! One even said, “Wow, that’s amazing and you’re not even from the South!” Best compliment ever. Thanks for the recipe!